The Partiologist: Back To School! While everyone is preparing the children to go back to school, I'm preparing a party for the children. In this case, all my nieces and nephews and any other child that shows up! 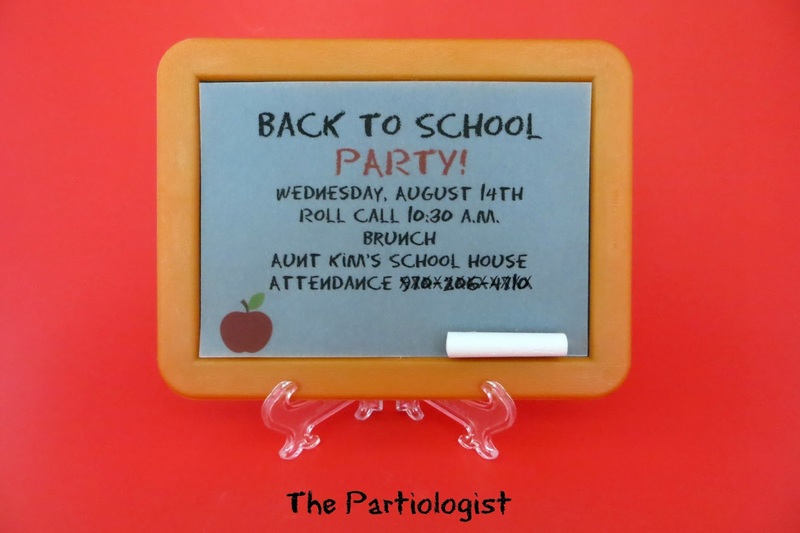 I have been working on this party for weeks so that I can give them the best and only back to school party they've ever had. And it started with the invitation. 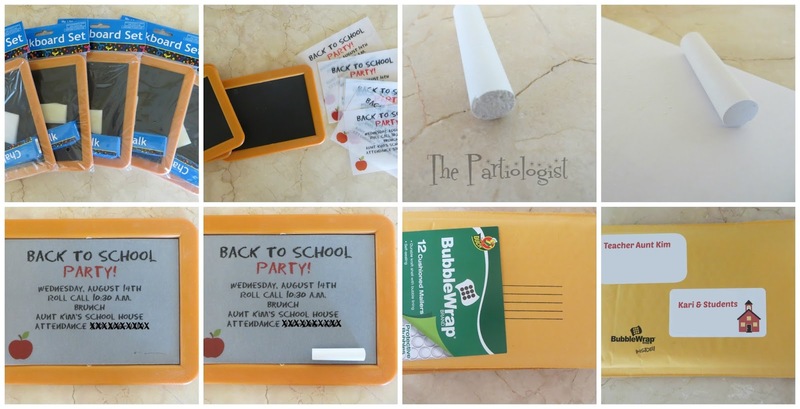 Because I don't have to go back to school, I had a blast making this invitation. It is a mini chalkboard which I added a sheet of vellum with the info and piece of chalk so the kiddos could play. 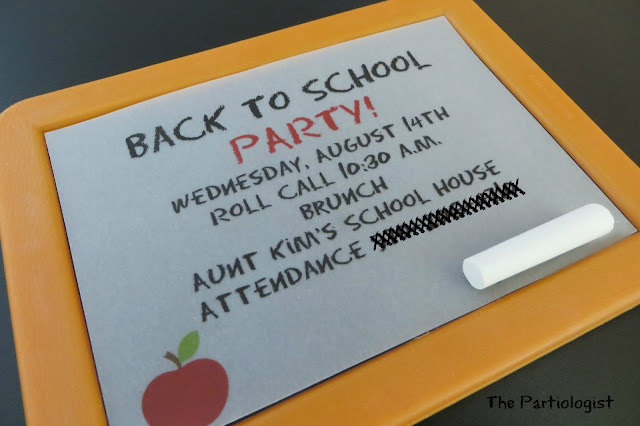 I was going to write the invite in chalk, but soon realized it could all be erased in an instant, so this idea came to mind. Stuck them in a manila envelope and had them hand canceled at the Post Office so they wouldn't break. And they arrived to all the students in A+ Shape! Here's how I made them, just in case you're wanting a cute invitation! 1. Set of twelve chalkboards. 2. Print the invitation on vellum and measure to fit on the chalkboard. 3. Broke the chalk (that came in the set) in half. 4. Drew on paper to make the edge smooth. 5. Make a small line of hot glue on the bottom right corner. 6. Add the vellum paper. 7. Hot glue the chalk on the vellum in the same corner. 9. Address the envelopes to the mom and her students! 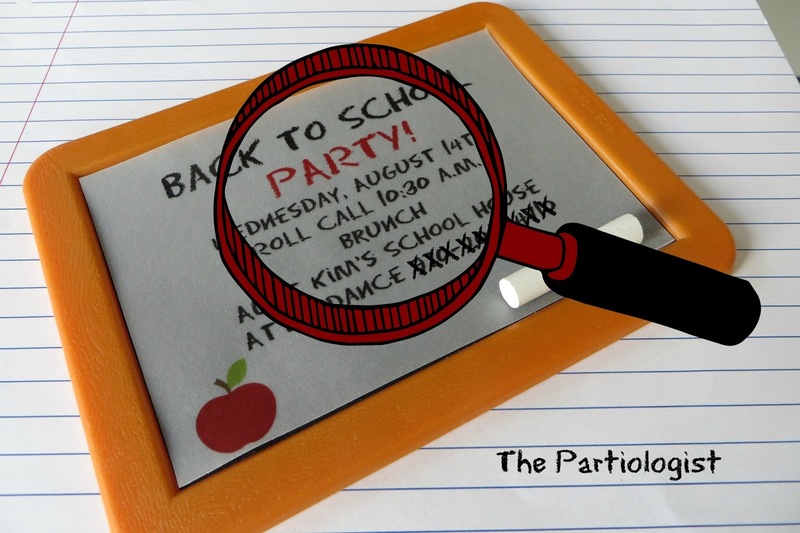 A Back To School Party and I'm inviting YOU to attend all classes! Or, perhaps you just need a little something for the teacher? On one of my many trips through Hobby Lobby, I saw paper clip bookmarks. And a light went off, it was dim, but still it went off. And this is what happened. 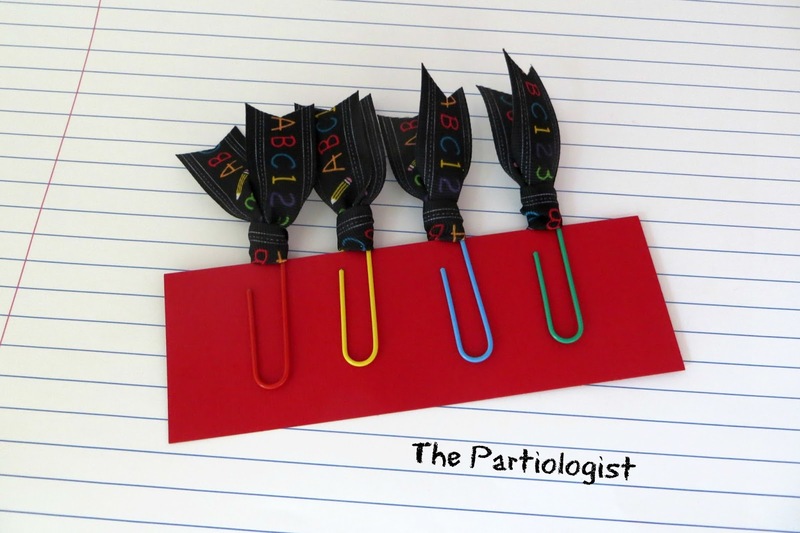 Bookmarks for the teacher! You do want to be the teacher's pet don't you? With two inexpensive items, you will be. 1. 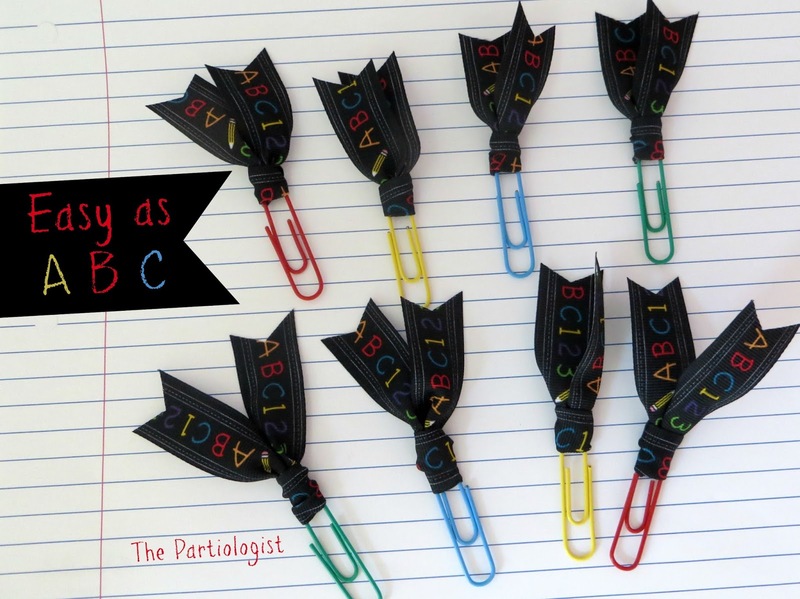 Bright colored paper clips from the dollar store. 2. School ribbon from Hobby Lobby. 3. Cut 6" lengths of ribbon. 4. Fold the ribbon in half. 5. Thread ribbon through paper clip. 6. Take the two edges and pull them through the loop part of the ribbon and pull tight. 7. 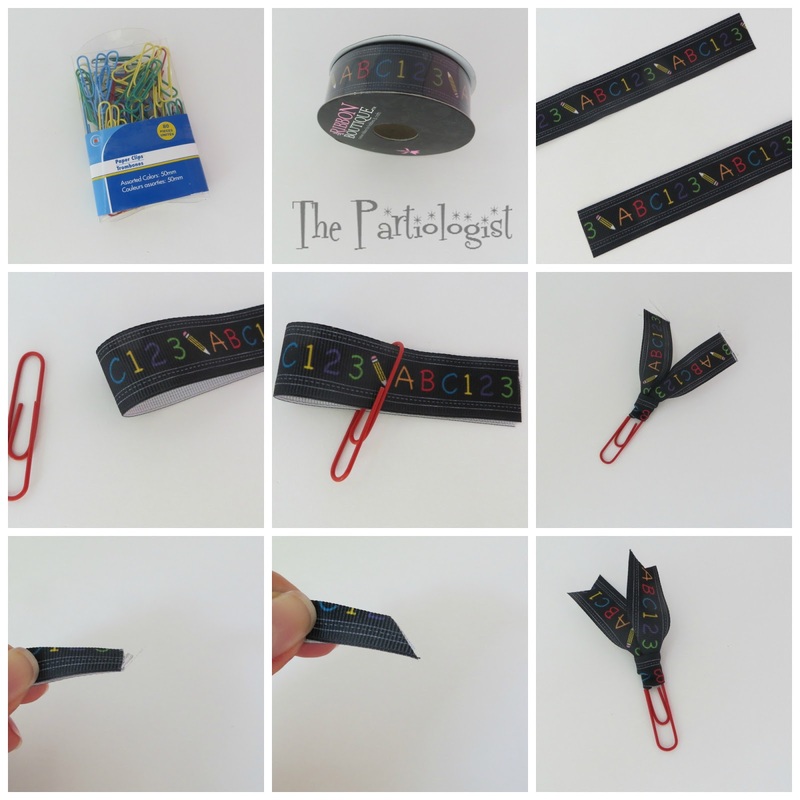 Fold the two ribbon ends in half. 8. Cut the top off in a diagonal. 9. Now your bookmark is ready! It's going to be a Great school year - Book Mark my words! Thank you Christina - I should have included a photo of the kids playing with the invite! Someday, you'll have to make those invitations!! Thanks! The best invitations ever from the most fun, creative Auntie ever! I love the school ribbon too! Oh, these are great! I can't wait to see the rest of the party! You are a fun aunt! I've always wanted to host a back to school party - I must say it has been fun! That makes me happy that you noticed "Book Mark My Words!!". Thanks Paula! Amazing aunt Kim!!! Can't wait to see the other creative things you come up with!! Thanks Lisa - I've got loads to share! I'll be sure and share my grades with mom! Thanks! Those are such a creative work. Every kid must have their hands on such things and it would be so much fun. Thanks Kim! Thank you for the comment - from what I hear the kids did have a great time with the little chalkboards! Both the invites and the bookmarks are perfect! I love that the invite was a gift the children could use again. I can't wait to see more! We liked a lot your idea so we decided to add it to our blog!